Picture a vineyard. Thinking of some lush California hillside with plenty of green? A lot of wine is actually grown in barren sand. Since 1979, a small region in Provence’s Bouches-du-Rhône, which extends from the Gard Coast to the waterfront village of Saintes Maries de la Mer, has been known for producing rosés grown in its sandy and rocky soil. For these wines, sand is as much of an ally as are the sun and the wind. 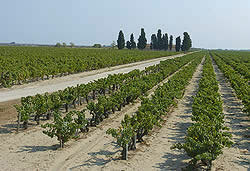 In fact, sand allows the grapes to escape the threat of phylloxera, a sap-sucking insect that rages through the vineyards here. Additional protection comes from a network of about a hundred kilometers of soft-water canals. These waterways also protect the Phoenician juniper and the laughing frog plants that make up rosé’s distinct terroir. Altogether, this region is home to 2,000 acres of vineyards, 1,500 of which are dedicated to the “Vins des Sables,” or wines of the sand, whose production is approximately 50 million bottles a year. We’re talking mostly rosé, vin gris, or the very pale gris de gris. In 2005, the Champagne group Vranken-Pommery-Monopole (the world’s second largest Champagne group and famous for posh brands such as Heidsieck & Co. and their signature, Pommery) took over the vineyards, thus becoming the largest worldwide producer of rosé and establishing themselves as prime distributors of “Vins des Sables.” The group, in partnership with Listel, has created a few prestigious vintages such as the light Pink Flamingo and Franc de Pied, a gris de gris. Both were awarded silver medals at the 2006 International Rosé Fair in April 2006 in Nice, and seem destined to put “Vins des Sables” on a world map. The Gulf of Lion doesn’t have the monopoly on these sand-born offerings, and the vintners of Vranken-Pommery-Monopole aren’t the only ones growing grapes in sand. On the Landes Coast in the Southwest of France, similar vineyards are situated between sedimentary dunes and sandy plains, producing reds with notes of violet and heather and perfumey whites and rosés. Elsewhere in Europe, south of Hungary’s Great Plains, in the region of Pusztamerges and de Morahalom, the sandy soil has been retained by vines since the 18th century, producing light and fruity wines. 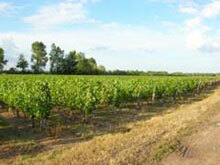 However, the Italian “wines of the sand” have the most in common with the ones from the Gulf of Lion. They are grown on sandy marshes in the province of Ferrare, the coastal band that extends south of Venice and the city of Goro to the Po River. The principal grape is the “uva d’oro,” or golden raisin, transported there from Burgundy by Renée de France, daughter of Louis XII, when she was married in 1528 to the Duke of Ercole. Four of the wines that are produced in this fertile region have just been given DOC (Denominazione di Origine Controllata) status: Fortana, Merlot, Cabernet Sauvignon and Bianco del Bosco. Fruity and light, these wines marry perfectly with some of the other natural resources of these marshes—game and fish, especially grilled eel.